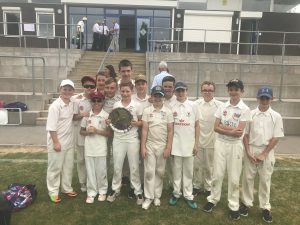 JMHS U12 cricket team were crowned plate champions this term after a fantastic season. JMHS came joint first in the league alongside St Mary’s and Kingstone this season and played a round robin tournament to decide the winner of the City and South League. After two matches, JMHS finished second in the group with a total score 147 runs for 4 wickets where Kingstone won the group scoring 147 runs for 3 wickets. JMHS played Bishops in the plate final. Bishops opened the batting scoring 68 runs for 5 wickets after 16 overs. JMHS scored 69 runs after 13 overs winning the U12 Herefordshire County Cricket plate final.